You should always begin from the premise of, they’re all amazing. Every player in the major leagues — every player is amazing. The worst player you’ve ever seen on your favorite team possessed the sort of raw talent most baseball players could only dream of. Given that, in this age of information, I absolutely love the data that allows individual players to stand out. They’re the freaks among the freaks. Take pitchers. This season, Aroldis Chapman has thrown 48 pitches at least 102 miles per hour. The guy in second place has nine. Or, take hitters! We can do this now. This season, Giancarlo Stanton has hit six baseballs at least 118 miles per hour. The guy in second place has one. It’s unbelievable that anyone would stand out. Those are some of the most delicious statistics. Now, pitch velocity? That’s a skill thing. Batted-ball velocity? That’s also a skill thing. What I’m about to talk about isn’t exactly a skill thing in the same sense. But I want you to know something about Jacoby Ellsbury. I need you to know something about Jacoby Ellsbury. In what way does Jacoby Ellsbury most stand out from the crowd? Eight times already this season, Ellsbury has reached base on catcher’s interference. The guy in second place has done it twice. Ellsbury has already tied the all-time record for a season. It is the All-Star break. I made a note to write something about this a few weeks ago, when Ellsbury was at six. Then it happened a seventh time on July 1, and it happened an eighth time on July 4. What’s funny is I already wrote about this phenomenon in August 2013. Back then, Ellsbury seemed weird because he’d reached on interference four times. Already this season, he’s doubled that. 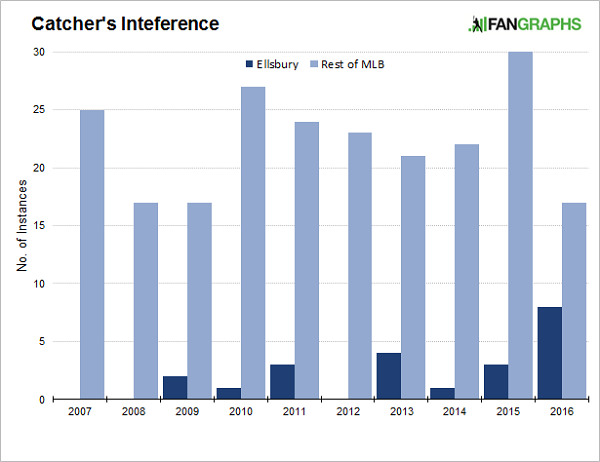 Here’s Ellsbury’s entire career, and the last decade of the rest of Major League Baseball, in terms of times reaching on catcher’s interference. It’s not a new thing, and it is a new thing. It’s not a new thing, in that Ellsbury has done this a bunch of times before, and it’s even factored into advance scouting reports. Other teams have long warned their catchers about Ellsbury’s stance and swing path. What’s new is this rate. Eight times, already, in a half-year. If other teams are learning, they’re not showing any evidence. Ellsbury has taken 0.33% of all big-league plate appearances this year. He’s drawn 32% of all catcher’s interference calls. It is genuine silliness. C.J. Cron, Aaron Hill — they’ve reached twice on such interference, which is weird enough. With Ellsbury, he’s reached on catcher’s interference twice as often as he’s homered. Here’s the most recent case. On July 4, Ellsbury swung and caught a piece of Dioner Navarro’s glove. Ellsbury still hit the baseball, and he hit it fairly well, but it was also a routine fly out. The only difference was Ellsbury remained at first base after running down the line. The scoreboard up there says none on, two out. 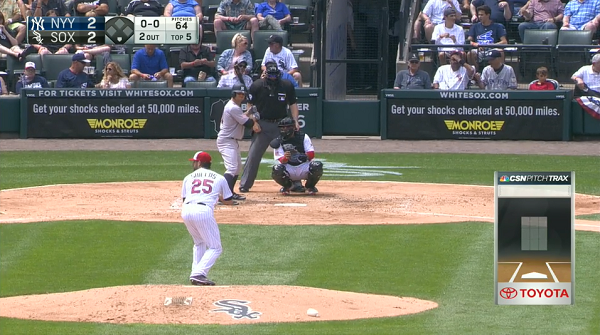 Actually, there was one on, with one out, which is why James Shields worked from the stretch, and looked over at the bag. 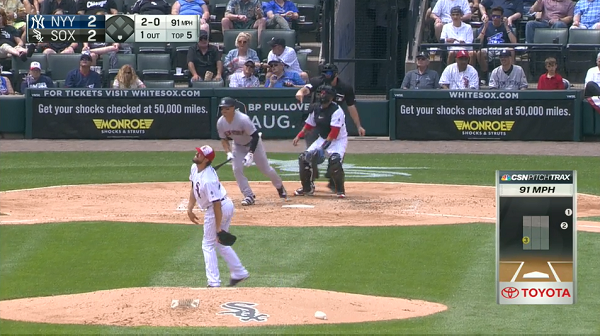 The White Sox broadcast didn’t know to expect that Ellsbury could pull this off. The Yankees broadcast was on it. They’ve seen this happen enough. And also, while actual catcher’s interference can be subtle, the sign for catcher’s interference is anything but. It feels cheap, maybe. Like reaching base on a technicality. It is reaching base on a technicality, but it’s important to recognize that Ellsbury isn’t doing anything against the rules. I can’t imagine this is something he tries to do on purpose, because he’s up there trying to hit the baseball, and you can’t be thinking about two things at once. Other hitters stand even further back in the box, and this is just a part of Ellsbury’s swing — his natural path sometimes takes him a good distance backward. Catchers are supposed to know about that. They’re supposed to move a few inches back. Many of them do. Obviously, not all of them do. Ellsbury’s on an incredible pace. None of the interferences have won the Yankees a ballgame, but a time on base is a time on base. Ellsbury’s “effective” OBP is higher than his real OBP by 15 points. According to that linked article from the New York Times, Pete Rose holds the career record with 29 times reaching base on catcher’s interference. Ellsbury, today, stands at 22. He has an excellent shot of making the record his own. I suppose he has some shot of doing it this very year. We hoped you liked reading Jacoby Ellsbury Is Out of Control by Jeff Sullivan! On at least one occasion this year Ellsbury also made contact with the catcher’s mitt on a check swing and was not awarded first base. It is actually a sad reflection on my life, Jeff. The fact I know this is a function of how much Yankees baseball I watch, and Yankees games start at midnight and end at +3AM in my time zone. So thanks.